Project CBD: I’m Martin Lee with Project CBD, and welcome to another edition of Cannabis Conversations. And today, we’re going to be speaking with Kelly Dunn and Josh Sarvis, British Columbia based farmers, who are pioneers in what’s known as regenerative agriculture. It has specific meaning and relevance for cannabis growing. So we’re going to talk about that. But let’s start with a little explanation. What is regenerative agriculture as compared to, let’s say, organic gardening? Dunn: Regenerative agriculture is really about putting back into the earth – it’s regenerating, sustainable practices, and the word sustainable is used really often. And we really don’t want to sustain a broken system. We’re really looking at Big Ag and our agricultural projects that we have all over North America, and really the world, is depleting the soils. It’s depleting our water system of really valuable nutrients. It’s just not necessarily sustainable. Sarvis: We know that since the Industrial Revolution in the late 1800s, we’ve lost 50-60 percent of the topsoil on earth. And that’s what we’re growing on, is topsoil for food. So, regenerating life on earth and regenerating the topsoils is imperative to our existence. Dunn: And regenerating with both vitamins, minerals, as well as microbiology, which we feel is incredibly important for the uptake of plants. Sarvis: And feeding the microbiology of the soil. Project CBD: You’re speaking about farming in general. What about cannabis farming specifically? Why is regenerative agriculture something that cannabis farmers should be paying attention to, if not actually engaging in? Sarvis: Well one thing that’s really important is cannabis is a dynamic accumulator, it pulls up what’s in the soil. So for us to know what’s in our soils, in the microbiology and the heavy metals or pesticide residues is extremely important because the plant can pull it up. But that’s also really excellent if you have really healthy soil because now it’s pulling up all the health out of the soil. So as a cannabis farmer, you have to be really careful about the inputs that you put in your soils and what the plant’s uptaking. That’s why the regenerative systems with polyculture and inner planting and companion planting is really important for microbiology, and insects and pollinators. Dunn: And also the cannabis industry is booming right now. There’s plots of lands that are coming up, hemp farms, different cannabis farms, all over North America as well as all over the world. Because it’s sort of this new agricultural product that’s coming out, and it’s so scrutinized with its testing, we believe that regenerative agriculture practices is the only way to grow it. Not only is it raising the microbiology beneficials in the soil but it’s also raising all of the beneficial attributes that cannabis has. So when you grow in a really healthy regenerative soil and environment, you’re raising your cannabinoid profiles, you’re raising your terpene profiles, and the overall medicinal value of the plant as well as, during that same time, you’re rejuvenating the soil. 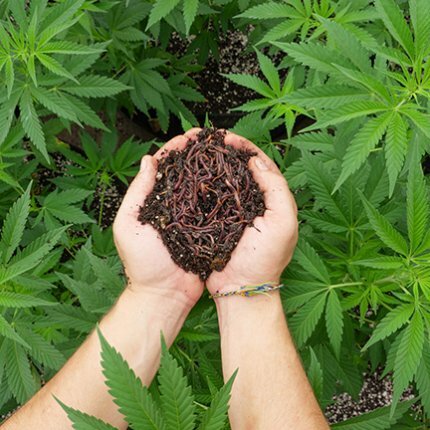 The cannabis plant has this wonderful capability – which a lot of other plants don’t – is to communicate with the soil in the same way as communicating with the environment because of it’s adaptive genetic qualities. So we feel like why not give it the best farming practices that you possibly can to bring out the highest quality product. Project CBD: You’re based in British Columbia. Your farm, if you will, is called Dragonfly Earth Medicine. You also have links to growers in the United States, Oregon. Sarvis: We originally came from Oregon, back in Oregon had a child, and then moved up to British Columbia. So we’re lucky that we have this beautiful network and the ability to be legal and working in both countries. We’ve adopted the lifestyle of the West Coast in America and the beautiful spirit that’s there, along with the nature and the love of British Columbia. It’s been great for our business. And we’ve kept it really grass roots and intentional. Project CBD: In addition to growing plants, cannabis, other plants, you’re also involved with a certification program. Maybe you can tell us about that. Sarvis: We started with products, so we have an organic product line for 10 years – Dragonfly Earth Medicine products are really great and farmers have been using them for years. And that lent us into creating an organic certification that goes beyond organics for cannabis farmers, because there wasn’t one at the time. Project CBD: And what is that called, that certification program? Dunn: The Pure Certification. So it’s the Dragonfly Earth Medicine Pure Certification. It expands all over the globe. We decided that we didn’t want to go with a third party, USDA organic standard, because we really feel like if you were a cannabis farmer and you’re following a lot of their rules and regulations in the products that they allow into this particular certification of the USDA, you won’t pass. Sarvis: It could potentially still fail tests. Dunn: You could still be failing tests. And we feel like it’s more important to get out the education to the farmers of how they can – not only be healthy to the earth but healthy to their final products as well. Sarvis: It sounds really close to the land, living on the land, we just felt energized to make a system that was kind of a way of living almost. So, we have USDA standards as a baseline in what we do, but we go beyond, having farmers do more. Project CBD: For a farmer to acquire such certification, how much does it cost them, what’s involved in that? Sarvis: Our certification is free because it’s a community monitored and community run certification, and we feel like that’s more powerful than paying for something. We feel like there’s a twist on it because it’s not something that you can just pay to play, it’s not something you can just have a bunch of money, set up a farm, and “boom” have a certification. It’s something that a person that has the certification is truly stewarding the land, is making the world a better place. We feel like small farms or even scalable small farms can save the world. And they might have to be the ones that save the world. So it’s not just that they can but they might have to, so now we’re looking at – it’s almost like trying to go for a home run – we’re trying to create the cleanest product in an environment that’s healthy with family and systems that are productive. Project CBD: You mentioned “soil microbiology” earlier. What are you referring to when you speak about that? And why is that important in terms of the health of the plant and ultimately human health? Is there a connection between the microbiology of the soil and how people function? Dunn: There’s a massive connection. What we know is we’re losing 90 percent of everything on the planet basically. We’re losing 90 percent of microbiology on the planet, and we’re losing 90 percent of plant species on the planet. We’re in a really interesting time right now. We really have to make a difference. Not only are we maybe losing 90 percent of our wildlife and different species, but we’re also losing 90 percent of our microbiology, and that means our beneficials. Project CBD: What do we really mean by that – microbiology in the soil? When you say “beneficials,” for people who aren’t farmers, why is that significant? Dunn: It’s incredibly important because it creates like the digestive interaction that’s happening within the soil. You know, if you’re looking at an NPK ratio, and how that they do Big Ag, you’re directly feeding the plant. It’s almost as if you’ve got an IV. Of course we can all survive off of an IV, but you can’t survive very long, and you can’t fight off any types of viruses or things that might come toward you because you need to have the whole picture, which is the microbiology inside of your body as well as the microbiology inside of the ground. That creates better uptake of nutrients and minerals. So when we talk about beneficials in the soil, we’re talking about thousands of different types of species in the soil that help digest nutrients so that the plant can uptake it through other different ways. Sarvis: So microbiology is fungi and bacteria that live in the soil and they secrete and break down minerals and leaves – a plant can’t eat a leaf that hits the ground, microbiology has to digest the leaf and essentially excrete or poop out the excrement and that’s what the plant root can eat. And the plant root puts out exudates or enzymes, essentially like pheromones that attract and grow bacteria and fungi based off the stage of the plant. So the microbiology is essential to feeding the roots of the plants. That’s what allows the plant to get the nutrients that it has inside. Dunn: It’s identical to us. We can eat a sandwich but without the microbiology being able to break down in our own gut, and in our own body, we can’t uptake those nutrients. Sarvis: It’s very similar. The gut bacteria in our body is very similar and almost the same as what’s in the soil. Project CBD: That’s interesting, because this is really hot now in terms of natural medicine, they’re talking about gut dysbiosis, the microbiome, and we always think of that as the human gut they’re talking about. You’re saying that there’s really – not just this intimate connection – but almost you’re talking about the same thing in a sense. Project CBD: Microbiome in the soil, microbiome in the gut and ultimately we’re talking about human health because they’re finding that a gut dysbiosis, something off there – depression, obesity, Parkinson’s – so many diseases seem to emerge from that. So, healthy soil – how can it potentially address these kinds of conditions that cannabis therapeutics is trying to address? What’s the connection? Dunn: When we look at the gut biome of somebody who has cancer, IBS, all different types of issues, depression (it can really go on), all of the different maladies that humans have, when you touch the gut of that person you’re realizing that it’s completely devoid of a tremendous amount of microbiology. And because of the toxicity in our water, the toxicity in our air, the toxicity in the food, a lot of pre-prepared foods that people are eating, as well as the pharmaceutical industry, it’s killing a lot of that microbiome inside of our body. And then when we go and we look at the soil, that’s exactly what’s missing. So the beneficents that are in the soil is what’s missing in our bodies. So there’s not, something has happened in the new modern world that we’ve entered into, that when we’re saying that we’ve lost 90 percent, well we’ve lost 90 percent of what’s in the soil as well. Maybe we’ve gone away from really important regenerative agricultural practices where we were actually eating the dirt, or we weren’t thinking about, oh hey we didn’t need to necessarily wash that carrot or we don’t need to put it through a bleaching program or something like that to “sterilize” it, because it’s “sterilization” of what we’re doing in the modern world today is actually sterilizing ourselves. So we need to look toward the intelligence of the earth. And if you really think about it, all the earth does in nature is make soil That’s her number one goal. All she’s doing is making soil, and healthy soil at that. So how can we mimic that to be able to have our own healthy microbiome as well as a healthy microbiome within the earth. Sarvis: When she’s talking about pathogens or beneficials, without naming the thousand strains that beneficial, essentially in microbiology there’s a balance of pathogenic microbes or beneficial microbes. Project CBD: Both in the gut and the soil. Sarvis: So a lot of us drink probiotics or there’s a lot of probiotics out there, and probiotics are really important and really strong, but they also don’t necessarily last very long in our digestive track and they might stop in our upper digestive track or in our stomach; but when we ingest soil microbes and soil it goes through our system and can inoculate our whole system. So we’ve been tasting people’s dirts on our way down – we’ve been visiting farms – and tasting dirt and it feels really good to get that kind of inoculation. Like Kelly said, as a society we’ve sort of moved away from the dirt. So then we’ve lost the ability to process stuff, so we get tox-ed out and those are the things that cause the ailments. Project CBD: You’re based in Canada most of the time. Canada has legalized cannabis, and along with that there’s a change of the whole situation. There’s been cannabis growing in Canada for a long time. What’s your take on what’s going on in terms of the corporatization of cannabis? I want to just add one little anecdote: When I was in Canada last, I was speaking to some medical patients who basically were complaining about the quality of the cannabis having declined or deteriorated accompanying this corporatization process if you will, and that it forced this particular medical patient (who was an epileptic) to seek out sources outside the legal system, to go back to what he was using that was actually working for him better. What is your feeling about that as you are part of the cannabis situation in Canada? You’re talking about a practice that’s not really what’s going on with corporate cannabis. What’s your feeling about that? Sarvis: What we’ve entered into is a legalization, a federal legalization model. It’s more of a regulated model, and a lot of those companies that have been created over the last four years are giant modeled corporate cannabis. It’s large-scale 3 million square foot operations, really huge, and they’re not using soil as their medium. So you’re creating these big systems using rock wool as a medium and after every cycle they have a giant pile of garbage to deal with. So not only are they not growing in accordance to earth, they’re also using automated systems that don’t really employ people. It’s also disconnected from the culture that started the cannabis, the whole cannabis experience in Canada. Those are the small people. Project CBD: Let me play devil’s advocate slightly here. So if I’m a big cannabis corporation in Canada and I’m learning about regenerative gardening, I might say well that’s great, small is beautiful, but we’re big, it’s not really relevant to what we’re doing. How would you respond to that? Is the type of farming you’re talking about, is it scalable or must it always be “small is beautiful” type of approach? Dunn: Well I think, to sort of answer first off where you’re talking, these are big corporate entities that really don’t have any kind of background in cannabis first off. They don’t actually have background in agriculture really at all. They just have a lot of background in how to run a corporate modeled business. So at the top of that pyramid is making money. The top of the pyramid is not helping patients and growing a really high-quality product. It’s just not. I believe that in time they’re going to realize that if they’re going to be spending all of this money and they’re going to want to be part of corporate cannabis then they’re actually going to have to grow a product that is viable, that is going to be able to pass tests, because that’s been over and over again that these big corporate models are not passing the tests. They’re not growing very good cannabis. And they’re finding that they’re getting more money from their insurance claims of not growing the cannabis then actually having a crop that’s viable. So, to sort of ask whether this corporate cannabis model is working – it’s not. It’s not working. It can work in an idea. It can work on the NASDAQ. But as far as putting out really important medicine to the people, whether they’re using it recreationally or whether they’re using it for medicine, you know. Sarvis: It is scalable too. There are people that are taking it on. A scalable property would look really different in a regenerative model. You would have a forest zone, you would have an area to propagate inputs for your land – and there are some models in Canada where that’s happening in Ottawa, and we’ve met some people who are doing some really beautiful things. But I would say, is the system that’s not regenerative scalable? Is Big Ag, is that actually scalable? Yes, it’s being scaled. But is it healthy for us? And is that actually successful? Dunn: Yes, so we would like to challenge the idea that Big Ag is not scalable. Sarvis: I think this is scalable, but I think partly the scalable is the working together. So when we look at other food models, and we let’s say cocoa, the cacoa and cocoa models, or the coffee models, or even bananas, and there’s a lot of different wine industries where people have to work together, I think the scalable is recognizing that we all have different biomes and bioregions, and that we might have a different thing that we can produce better and it’s the working together and being a collective – that’s the scale – and that’s what’s good for the land. Dunn: And with hemp farmers, we know that hemp is an amazing crop. It can clean all of this land that we’ve really dirtied up with this NPK idea of Big Ag very rapidly. We’re seeing this happening in China, that they are doing to massive scale, 50 million acres of hemp that was a really toxic environment. Two years later we’re studying the soil and it’s coming up totally clean and has all of the microbiology set in there. So really, we just need to follow the mentor, and the mentor here is the plant itself. We can be over heady in our own human existence and trying to figure it out, but if we really just follow what nature has given us as well as what the plant has brought us up to this point, it really just opens the door for an “aha” moment. We don’t need to be so heady about it. It just happens. And it wants to grow. It wants to clean soil. And it wants to clean the environment. Sarvis: It wants to do the right thing. Project CBD: Thanks very much Kelly Dunn and Josh Sarvis. Maybe you can share with us how people can contact you if they’re interested in regenerative agriculture. Sarvis: You can find us at dragonflyearthmedicine.com for our products, and for the pure certification and the farms, it’s dempurefarms.com. Project CBD: Wonderful work. Thank you very much. Sarvis: We appreciate what you’re doing. Thank you so much for having us here.